I thought I’d switch it up a little bit and try something new before I begin my next book. These were totally fun for me to make, and they are now for sale @ Six Days Art Co-op (www.sixdaysart.com). Soon to also be found @ LoveArt Gallery in Sellwood (http://loveartgallery.net/). Most artists get commissioned pieces that involve a beloved Chocolate Lab or a fluffy kitty- but me? I get the interesting ones. The first odd pet commission I got was to paint a pair of Box Turtles and their four newborn babies. I decided a fun way to represent them would be to stack them, hence the piece “Turtle Tower”. This was years ago. I painted a dog or cat portrait here and there since. Recently I’ve completed a commission for a lovely couple and patron of local artists. 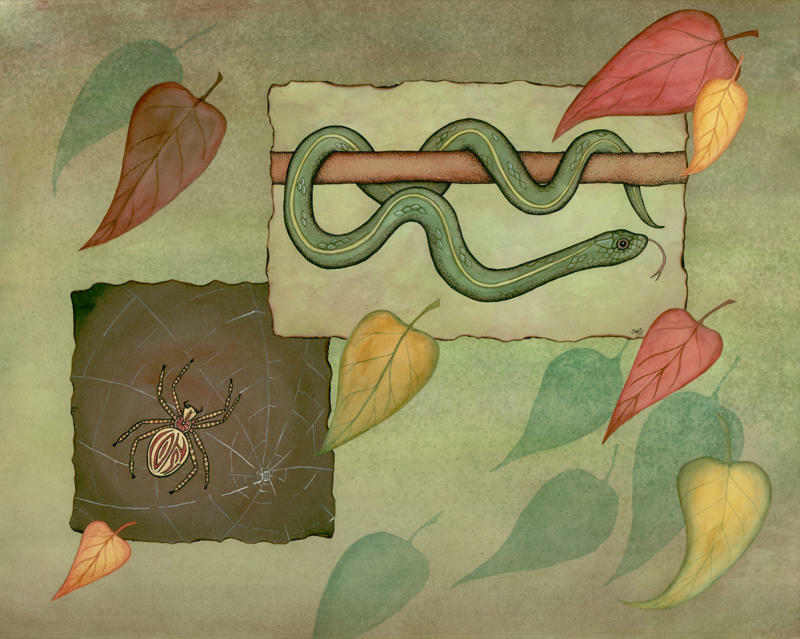 It is of their little garder snake who dwells inside the home, and a “pet” spider who makes its’ appearance every now and then. I included the client’s initials in the abdomen of the spider for a fun surprise. It really was an exciting piece for me to do, and I can’t wait to see what I get next: A tarantula? A chinchilla? Maybe a hedgehog?